Model 465A Apron Conveyor | Belt Scale | MERRICK Industries, Inc. Heavy duty 6” channel stringers. Unique approach-retreat suspension provides accurate weight measurement. Dual, precision, strain gauge load cells. 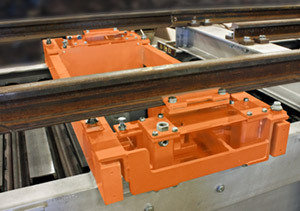 Weigh suspension can be shipped assembled as a single unit or disassembled for easier handling. Rails can be pre-cut and provided by MERRICK or supplied by customer and installed on site.